Thank you for visiting Cultural Survival to learn more about Indigenous Women and our work as we support Indigenous Women’s movements around the globe. Cultural Survival sincerely appreciates your support and help as we raise awareness of Indigenous Women around the world. Please join us we work towards a future where Indigenous Peoples' inherent rights and dynamic cultures, deeply and richly interwoven in lands, languages, spiritual traditions, and artistic expression, rooted in self-determination and self-governance are honored and respected. Thank you! Cultural Survival works to uplift the voices of Indigenous women. Whether that means ensuring Indigenous women are represented on our community media staff, creating space for safe participation in grassroots campaigns, or making sure women are part of decision-making at the local and international level, Cultural Survival is committed to supporting women as catalysts for social and cultural change and in their decisions affecting their lives, and those of their children and families. Read about the impact Indigenous women are having around the globe. El Programa Mundial del Fondo de Pequeñas Subvenciones para el Medio Ambiente lanzó el componente global de la Iniciativa de Becas para Pueblos Indígenas, en la Conferencia sobre el Cambio Climático en Marrakech, Marruecos, en noviembre de 2016 y, en la Conferencia de las Partes del Convenio sobre la Diversidad Biológica en Cancún, México, en diciembre de 2016. Cuatro mujeres Indígenas que representan a cuatro regiones fueron seleccionadas a través de un proceso competitivo como las primeras becadas a nivel mundial en el Programa de Pequeñas Donaciones del FMAM. The Global Environment Facility Small Grants Programme launched the global component of the Indigenous Peoples Fellowship Initiative at the Climate Change Conference in Marrakesh, Morocco in November 2016 and at the Convention on Biological Diversity’s Conference of the Parties in Cancun, Mexico in December 2016. Four Indigenous women representing four regions were selected through a competitive process as the GEF Small Grants Programme’s first ever global fellows. These women are carrying out work in the areas of biodiversity conservation and climate change adaptation. Entering Panama City, one may not know the rich history stored beneath the cracks of the sidewalks and paved roads, which, in 1510, absorbed the footprints of Rodrigo de Bastidas, who was sailing from Venezuela in search of new land and encountered the thriving civilizations of the Guna, Emberá, Wounaan, Ngöbe, Buglé, Bribri, Naso, and Dorasque peoples. Most Indigenous nations in Panama partially live on their ancestral lands as semi-autonomous reservations called comarcas. The Guna were the first to receive acknowledgment of their rights and are the most visible in Panama. Los recientes movimientos #MeToo y #TimesUp han sacado a la luz las horribles realidades que enfrentan a diario las mujeres de todo el mundo. Para muchas mujeres Indígenas, esa realidad es aún más grave. Las mujeres y niñas Indígenas son asesinadas y desaparecen a un ritmo alarmante. Según el Banco Mundial, mil millones de mujeres -una de cada tres mujeres en todo el mundo- se enfrentarán a situaciones de violencia por parte de su pareja o a violencia sexual en el transcurso de su vida. Viviana Calfuqueo teje en su witral, o el telar de pie Mapuche, en la puerta de la casa donde vive con su esposo, cinco hijos y su abuela. Introduce pacientemente símbolos ancestrales Mapuche en los tejidos de hilo de lana hechos a mano con fibra obtenida de las ovejas, criadas por familias en su comunidad de Allipén. Éstas familias se localizan a orillas del Lago Budi en el norte de la Patagonia, Chile. Sus dedos, como los de su madre y su abuela, separan con delicadeza los hilos teñidos de forma natural, para que el diseño en el que trabajan surja por completo en los siguientes días. Viviana Calfuqueo weaves at her witral, or Mapuche standing loom, on the doorsteps of the house she shares with husband, five children, and their grandmother. She patiently embeds Mapuche ancestral symbols into the colorful wool strands handmade with fiber obtained from sheep, raised by families in her community, or lof, of Allipén, at the shores of Lake Budi in northern Patagonia, Chile. Her fingers, like her mother’s and grandmother’s, delicately separate the naturallydyed threads so that the design of her work will fully emerge in the days to come. As the first Indigenous woman to run for president, María de Jesús “Marichuy” Patricio Martínez (Nahua) is making history in Mexico. Patricio was chosen as an independent candidate for the 2018 election during a convention in Chiapas that brought together the Mexican Indigenous Governance Council and the Zapatista National Liberation Army. This convention assembled 848 delegates representing 58 Mexican Indigenous communities and established the Indigenous Council of Government for which Patricio is the spokesperson. Hay pocas personas en este mundo que realmente iluminan una habitación con su presencia. Desde el momento en que te encuentra con Rosa Palomino Chahuares, es claro que ella es una de esas personas. Ella tiene una sonrisa y una luz en sus ojos que energiza e inspira, y su trabajo incansable de vida que promueve los derechos de las mujeres indígenas en comunidades rurales Aymara, es un recordatorio del potencial para superar la adversidad cuando uno es dedicado y optimista. "Creo que lo que nos distingue de otros grupos es nuestro optimismo. El 21 de enero de 2017, medio millón de personas, predominantemente mujeres, salieron a las calles en casi todas las ciudades de los EE.UU., y otras ciudades más en todo el mundo para la histórica Marcha de la Mujer. Vinieron a protestar sobre la nueva administración de Trump y su guerra contra los derechos de las mujeres, el medio ambiente, las minorías, la libertad de religión y la libertad de expresión, entre otros. There are few people in this world that truly light up a room with their presence. From the moment one meets Rosa Palomino Chahuares, it is clear that she is one of those people. She has a smile and a light in her eyes that energizes and inspires, and her tireless life’s work promoting Indigenous women’s rights in rural Aymara communities is a reminder of the potential to overcome adversity when you are dedicated, optimistic, and truly care about your cause. “I think what sets us apart from other groups is our optimism. I write as a sculptor of walrus ivory and bowhead whale bone, and as a founding member of Sikuliiq: Alaska Native Artist’s Advocacy Group. Sikuliiq means “new, thin ice along the edges of older floes.” It is a Siberian Yupik word from St. Lawrence Island in northwestern Alaska, my birthplace. As artists and allies we formed our Facebook group in response to the fallout to our precious subsistence resource of walrus ivory, stemming from President Obama’s 2013 Executive Order on Combating Wildlife Trafficking aimed at ending the elephant ivory trade. Māori activist Catherine Murupaenga-Ikenn is no stranger to the international Indigenous rights movement. She is often heard and photographed making moving and passionate interventions, calling on Pacific countries to respect Indigenous rights. Murupaenga-Ikenn hails from the iwi Māori of Te Rarawa and Ngāti Kuri in Aotearoa (New Zealand). Her voice reflects her passion. Her work reflects her commitment. Her legacy is an inspiration for many. Rebecca Adamson (Cherokee) is a businessperson and Indigenous rights advocate. She is the former director, president, and founder of First Nations Development Institute and the founder of First Peoples Worldwide. Born to a Swedish-American father and a Cherokee mother, Adamson grew up in Akron, Ohio and spent summers with her Cherokee grandmother in North Carolina. Hydraulic fracturing, commonly known as fracking, is posing a danger to Indigenous communities beyond its damaging environmental impact. First Nations in both Canada and the United State are being hit the hardest, where oil and gas companies with interests in the untapped resources of Indigenous lands are gaining ground. Fearing the effect that fracking will have on their lands and families many Indigenous women have begun to stand up with their communities to tell oil corporations, tribal councils, and their respective governments that enough is enough. In May 2014, the Foro Internacional de Mujeres Indígenas (International Indigenous Women’s Forum) awarded its annual Leadership Award to two extraordinary and committed Indigenous women: Joan Carling, a Kankanaey activist from the Philippines, and Rosalina Tuyuc, a Kaqchikel leader from Guatemala, received the honor due to their creativity in addressing social issues with exceptional leadership and courage. By defending Indigenous women’s rights, these women make significant impacts on community, national, and international levels. Matika Wilbur, member of the Swinomish and Tulalip Tribe, hit the road in December 2012 to embark on her newest photographic project entitled "Project 562:" an ambitious documentation of Native American people from every federally recognized tribe in the United States. These 21st century images provide a new perspective and update contemporary America’s perception of Native peoples. For many mestizo people of mixed Spanish and Indigenous blood from South America, identification with their native heritage has been difficult to imagine, let alone realize. Silvia Rivera Cusicanqui, a renowned sociologist from La Paz, Bolivia, has made this quest for identity her life’s work. For Cusicanqui, the “uneasiness” (her term) that inspired her to recover her Indigenous roots began with the decision to learn her mother’s language, Aymara; it had been her father’s native language, Quechua, that was spoken at home. what the world can learn from an Adivasi model of sustainable development. Indigenous women leaders gathered together for two weeks in New York to take part in a Global Leadership School for Indigenous Women and to participate in the UN Permanent Forum on Indigenous Issues. 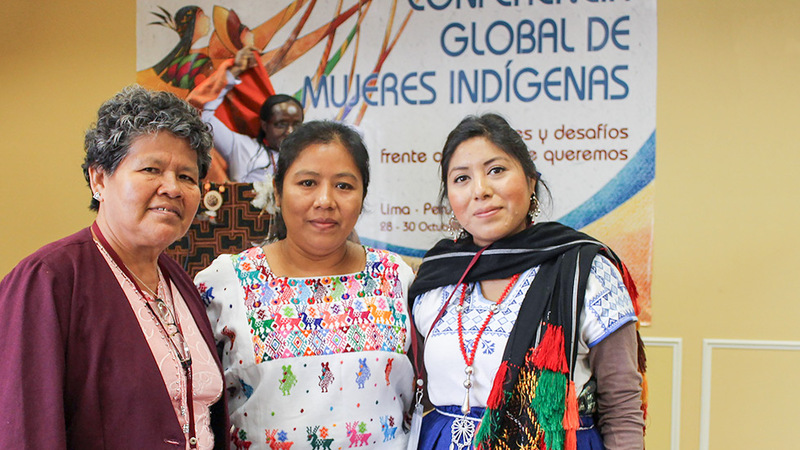 They traveled from regions of Latin America, North America, Asia, Africa, the Arctic, and the Pacific to take part in this leadership school run by the International Indigenous Women’s Forum (FIMI) from May 13–25, 2013. When Dr. Jessica R. Metcalfe (Turtle Mountain Chippewa) wears one of the most prized pieces in her wardrobe, a scarlet cape intricately embroidered with white feathers by Tracy Toulouse (Ojibwe), she stands up a little straighter. To don such a piece, she says, one must “live up to the cape…it is a huge statement piece, you have to be as strong and as beautiful as that cape.” The power of Native American fashion is contained within thousands of years of history, culture, traditions, and technologies, woven into each object crafted by Native American designers. In the fictional world of James Cameron’s Avatar, Pandora’s Indigenous Na’vi people defend their sacred territory against mining encroachment amid overwhelming odds. At stake is their intimate and unique relationship with the land, their way of life, and their ability to decide what kind of future they want for themselves. It is a story that Cultural Survival board member Karmen Ramírez Boscán and her Wayúu people understand well, because they grapple with these realities every day. Listen to interviews with Indigenous women leaders from our Indigenous Rights Radio programming. Please invest in Cultural Survival as we work towards a future where Indigenous Peoples' inherent rights and dynamic cultures, deeply and richly interwoven in lands, languages, spiritual traditions, and artistic expression, rooted in self-determination and self-governance are honored and respected. Make a gift to support Cultural Survival as we work to uplift the voices of Indigenous women and their equal status. Thank you!